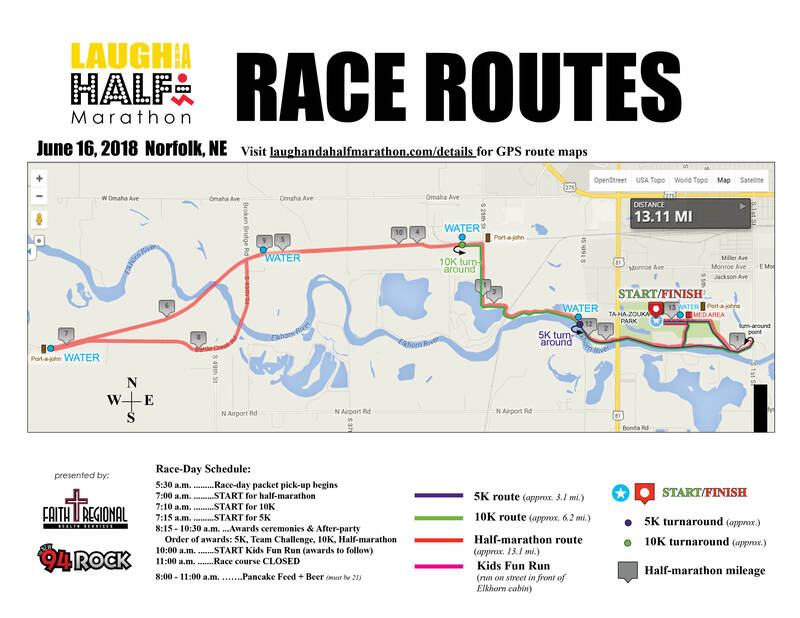 *Course Time Limit Enforcement: All runners or walkers must complete the course in less than four hours. Timing and course monitoring will be discontinued by 11:00 a.m. Schedule above is approximate and subject to change. Don't miss the FREE pancake feed + FREE beer (21 and older) and FREE inflatable mid-way for kids following the races! Plus, medals we will be celebrating and awarding our race and age-division winners near the start/finish area! Click for more details. Smiley Faces running to raise money for pediatric needs in northeast Nebraska! The kids fun run is for kids ages 12 and under and will run on a portion of the half-marathon/10K/5K route. The start will be on the road in front of the Elkhorn Cabin. The run will start at 10:00 a.m. Signs and announcements will direct children and parents to the start and give race instructions. Race day registrations will be taken. Children registered prior to June 2 are guaranteed a participant race t-shirt and ribbon. Registration from June 2-15 does not guarantee a participant t-shirt. Parents or legal guardians of all participating children must sign a waiver prior to the start. The top three winners in each age division (7 and under; 8-12) will receive special award ribbons. All participants receive a special Culver's frozen treat! The start and finish area for all races will be on McKinley Avenue north of Ta-Ha-Zouka Park. Please view the above route maps for more details. 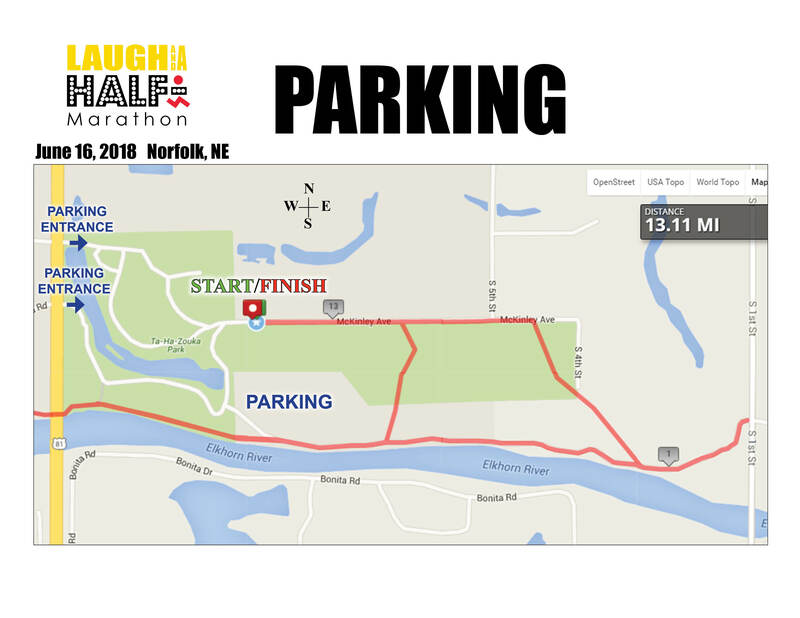 Participant and spectator parking areas will be located within Ta-Ha-Zouka Park and in the parking lot located just south of the Kids Fun Run (softball field) and McKinley Avenue near the start/finish area. Please look for signs and volunteers to direct you. Listen for detailed race instructions shortly before your race and give yourself plenty of time to get to the start, stretch and hydrate. There will be a large digital clock at the finish line. When you cross over the series of finish line timing mats, keep moving forward to allow room for others to complete their race and for you to enjoy the festivities at the finish area. Do not re-enter the course or cross the chip mats at the finish a second time. A number of motels and hotels are available in Norfolk and the surrounding area. Click for accommodations in Norfolk and Madison county. Tent and RV camping in Ta-Ha-Zouka Park is also available, however, space is limited and spots are first-come, first-serve. Early Packet Pickup will take place at the Pasta Party held on Friday, June 14 from 4:00 p.m. to 8:00 p.m. at Faith Regional Health Services, Terrace View Café, 2700 West Norfolk Avenue, Norfolk. One complimentary meal for the Pasta Party is included in the race fee. Additional pasta dinners may be purchased for friends and family at the door. Admission for guests is $5 per person (kids 5 and under free). Race packets will contain your race number, timing chip and safety pins. Race day Packet Pickup begins at 5:30 a.m. Please come early and enjoy the day’s festivities. Due to race morning time constraints, all runners are strongly encouraged to pick up their packets on Friday at the pasta party. No Race Day Registrations. Chip timing will be provided by Heartland Timing. Timing mats will be set up at the start and finish of the course. Please be sure to cross the mats and do not return over them. Fasten your race number securely to your FRONT using the safety pins provided. Your bib number must be visible at all times during the race. Timing chips are embedded into each participants bib number. Your time will NOT start until you cross the start line so don't worry if you are not at the front of the pack. Water stations with water and cups are located throughout the course; however, runners who desire additional hydration are encouraged to bring their own supplies. If you need medical assistance during the race, please notify a volunteer along the course. Medical volunteers are available to help and are authorized to remove runners from the course, who are deemed medically impaired. A first aid station with medical personnel will be available at the start/finish area and at the half-marathon half-way point. Medical personnel will also be monitoring other areas of the course. Norfolk, Nebraska typically sees mild to moderately warm and occasionally hot weather in June, with the city's average monthly temperatures ranging between 82°F and 58°F. On the day of the race (June 15), the average high is 81°F and the average low is 58°F. To ensure proper hydration, it is recommended that participants drink early and drink often. In the event of severe weather, specific instructions will be announced at the race start/finish area as well as communicated to runners and volunteers along the course.